Steinmann Mennonite Church is registered as an online payment recipient with all credit unions in Ontario, including Kindred Credit Union. You can use the payment function in online banking to do a one-time payment now or in the future, or schedule recurring payments. In the “Add Payee – Step 3” page, put in your offering envelope number as your account number. This number has to be four digits long so, if needed, add zeros in the front of your number to get to four digits. 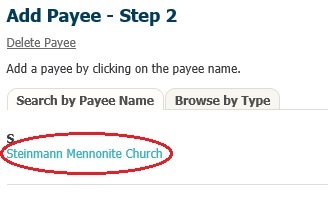 Steinmann Mennonite Church will now be listed as a payee in your Payments list. Your payment receipt will display. Note that you will get a charitable gift receipt from the church as usual.